We have now lived here full time for 15 months. Yes, we are SO happy! In November we were finally ready to start shopping for furniture and move out of our plastic chairs, tubs and those things. After finding four furniture places we did a lot of deciding and sitting. We wanted comfort first and a great look second. On November 16 we paid 60% of the price for 10 pieces of custom wood furniture. We provided the fabric for the upholstered parts because we are like that and have always collected and used appropriate fabric from all over the world. The prices were shockingly ridiculous. Ten pieces of custom furniture, we chose the wood and finishes, cost us a whopping $49,800 pesos. Do the math. That's a cheesey couch in the US. Turns out delivery was included. Today, 2.5 months later, the furniture all arrived. OMG!!!!! Words don't say what we want to. The plastic chairs are in the bodega and will go away. An acquaintance from the board has found yet another source, even cheaper. We'll have to see his stuff when it arrives and get more pieces from someone. Living in Zihuatanejo is living in paradise. IF you seriously need/want furniture, ask and we'll share what we have found. I know it's not that easy but can you find a way to post photos? Or perhaps email them to me? No, post the photos! Would love to see it! Pictures aren't happening, I don't do facebook or Flickr. We purchased all of our furniture up in Cuanajo which is close to Patz. We had an awesome time shopping for it and it was all custom made. Yup. We are really pleased with what we have. Looking forward to seeing yours! Two pieces are being delivered today, bedside tables/chests for approval, before we move forward with the rest of the apartment. I'll send you a pic. 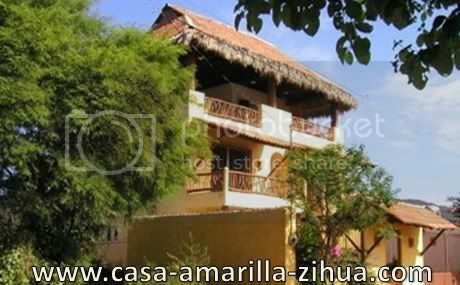 When we first built Casa Amarilla, we went to Cuanajo looking for a dinner table and chairs. All shops but one were closed because the owners went to work in the States, we were told. The one shop that was open had what we wanted. I asked if they can arrange shipping to Zihua. They weren't interested. We ended up buying a set in Zihua. The guy we are using is in Lazaro Caedenas and he comes to our apt to measure/consult and delivers. He made/installed the 5 doors in our apt. 1.5"/4 cm thick, solid Parota. Not judging, but I’m curious if any of you buyers of products made with exotic woods inquired as to the source and/or legality of said wood. Do you care? As we all know, just because something is for sale in public view doesn’t always make it legal or ethical. I've often been accused of being a tree hugger but, not being a carpenter, I couldn't tell an "exotic" hardwood from a regular hardwood. Our architect/contractor was a pretty decent guy, but our doors are made of bocote. Care? Absolutely. The guy we use is often held back by the time it takes for his supplier to get a permit to cut the wood then travel to where the permit allows him to harvest. Then the drying process kicks in - it takes patience. Absolutely! That was the first question we asked when we decided that parrota was our first choice. He claimed that our furniture took 2.5 months because of the time it took to get "politically correct" wood. The furniture we shipped here is all hard-rock maple and cherry from upstate New York or hand-painted from Peru and Brazil. The doors, kitchen and other cabinets are roble (oak), which is just as hard as parota and about as difficult to find, due to the drying process. Talleyho helped us find a terrific carpintero here, who also has made many additional custom furniture/cabinets/gates for other customers. is parota an "endangered species"there? is it local to Zihua/Guerrero area or pretty widespread throughout Mexico? is bamboo used much for furniture or building? As I'm sitting here typing, I'm staring at a beautiful, huge specimen just across the street in the center of a field. It would be interesting to see a comparison of growth rate among popular, local trees. We planted a Ficus in our front yard about 12 years ago and it's become huge, needing trimming on a regular basis. There's a guy in Zihua who makes furniture out of bamboo. We have one of his coffee tables. And our floor here in Montana is bamboo. I think I heard that he is at the Eco Tiangis on Saturday mornings. The furniture guy at Eco Tianguis every Saturday brings his bamboo furniture, next to him is the guy who sells articles made of coco shells. Both are quite impressive.